Kartik Aaryan and Kriti Sanon's Luka Chuppi is yet another small budget film that has managed to do well at the box office amidst big Bollywood releases. The rom-com, which is directed by Laxman Utekar, arrived in theatres on March 1 after garnering pretty much good reviews from the critics. The film had a fantastic opening day and then went to enter the Rs 50 crore club. If Luka Chuppi continues to perform this way then it will definitely surpass the Rs 100 crore mark at the Indian box office before ending its theatrical run. 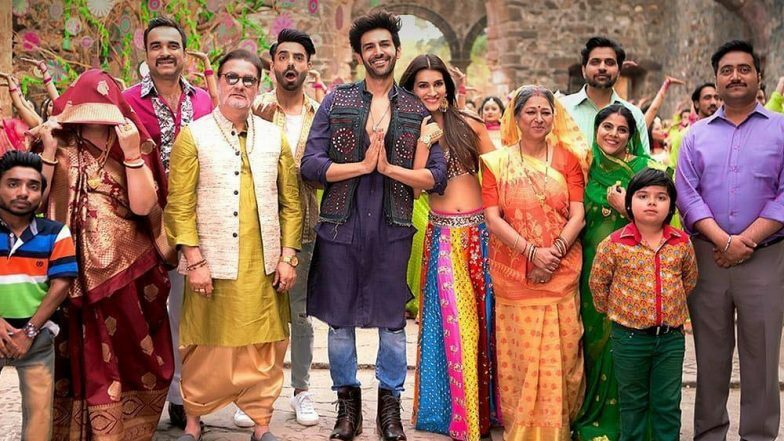 Luka Chuppi Box Office Collection Day 19: Kartik Aaryan and Kriti Sanon Starrer Romantic Comedy Rakes in Rs 85.19 Crore. Film trade analyst Taran Adarsh took to the microblogging site Twitter a while back and revealed the updated figures saying, "#LukaChuppi trends well in Week 3, despite reduced screens/shows... [Week 3] Fri 1.62 cr, Sat 2.25 cr, Sun 3.40 cr, Mon 1.33 cr, Tue 1.35 cr, Wed 1.17 cr, Thu 63 lakhs. Total: ₹ 86.99 cr. India biz." He also tweeted, "#LukaChuppi⁠ ⁠biz at a glance...Week 1: ₹ 53.70 cr, Week 2: ₹ 21.54 cr, Week 3: ₹ 11.75 cr. Total: ₹ 86.99 cr. India biz. HIT." Produced by Dinesh Vijan, the film also stars Aparshakti Khurana, Pankaj Tripathi and Vinay Pathak in important roles. Luka Chuppi Box Office Collection Day 18: Kartik Aaryan and Kriti Sanon's Film Fares Well on its Third Monday, Mints Rs 83.84 Crore. Apart from turning out to be a hit, Luka Chuppi has also become Kartik's biggest opener to date. The film beat Pyaar Ka Punchnama 2 and Sonu Ke Titu Ki Sweety to achieve this milestone. The rom-com is also the actor's highest week 1 grosser. And of course his first hit of 2019 too!